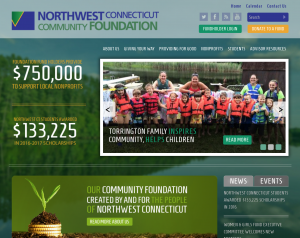 Kidd Group/3W Studios worked with The Community Foundation of Northwest Connecticut on a redesign of their website. The Foundation’s mission is to enrich the quality of life for residents in the 20 town service area of Connecticut’s Northwest corner through the generosity of fund holders. The Foundation provides local non-profits with a channel to receive grants that helps the non-profits meet community needs. The website was built in Drupal to allow the Foundation to update the site as needed with the most up to date information on grant opportunities. The site also allows Donors to contribute money online and to search for different non-profits in their database. The website additionally provides news regarding The Community Foundation.